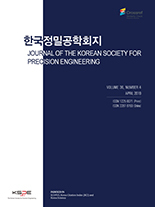 홍만복, 김광태, 윤여훈,(2019).새로운 무릎보조 외골격 메커니즘(ACE-Knee) 개념설계 및 인체 무릎 운동분석을 통한 설계 요구조건분석.한국정밀공학회지,36(4),373-381. This study presented a mechanism overview of a novel modular knee exoskeleton, ACE-Knee, and the analysis of the design requirements by observing human knee-motion characteristics. The ACE-Knee exoskeleton consists of 1) base frame at waist, 2) a 3-DOF (degrees of freedom) passive spherical hip, and 3) a knee driving mechanism. The passive hip is designed based on a 3R spherical serial chain such that it has RCM (remote center of motion) capability. For designing a compact and efficient knee driving mechanism, it is realized by two crank-slider linkages where two sliders are coupled with a linear spring. The proposed kinematic structure enables the driving concept of the passive support by the linear spring and the active following by an actuator. In order to setup design requirements, gait experiments were performed for level walking and ascending/descending stairs. From the analysis of experimental results, unique motion and quasi-stiffness characteristics of human knee were identified.